Kate has officially graduated from kindergarten! She is the only K2 student in her school and we were joking with her Principal that it should be called Kate's Graduation instead of K2 Graduation. Such a lovely gesture that despite having just one child graduating, they had a proper ceremony with a video montage showcasing her milestones. It was rather amusing and we felt a little pai seh that all these parents had to watch an entire video featuring her. But it really shows how each and every one of the children are respected as individuals, well-loved and so precious to the teachers. Several of the parents congratulated us, and many still remember her as the new kid at the beginning of the year who cried for an entire January before settling down. 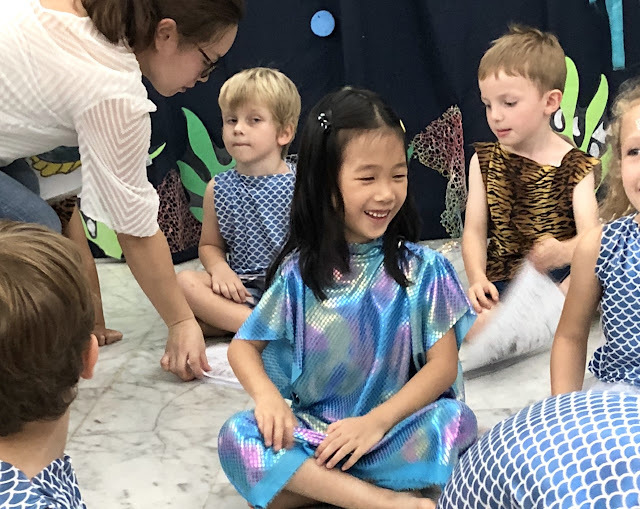 They commented that she is now a confident child, striking conversations with them and having made many close friends of all ages and nationalities. She has really grown and blossomed in one year. When she left her Montessori after K1, she was well-prepared academically and could read and do Math. However, she was afraid of new experiences and challenges and would shy away from trying new things or would make excuses to escape from things she felt was too difficult. How fortunate that I found this gem of a school. Her teachers spent time to talk to her, walk her through her fears and to empower her with a can-do attitude. They gave her responsibilities like patting the younger children to bed and she was a big sister to many of the toddlers. Now that the end of the year is nearing, we have been preparing her for the big transition as I know she is not one who takes transitions easily. She was really excited to follow the footsteps of her older siblings, packed her big new desk with files and stationery all lined up neatly, and told me that she will be able to wake up at 5.30am to take the school bus. Yesterday, she went for her P1 orientation where they were brought to their class and met their new form teacher and classmates. 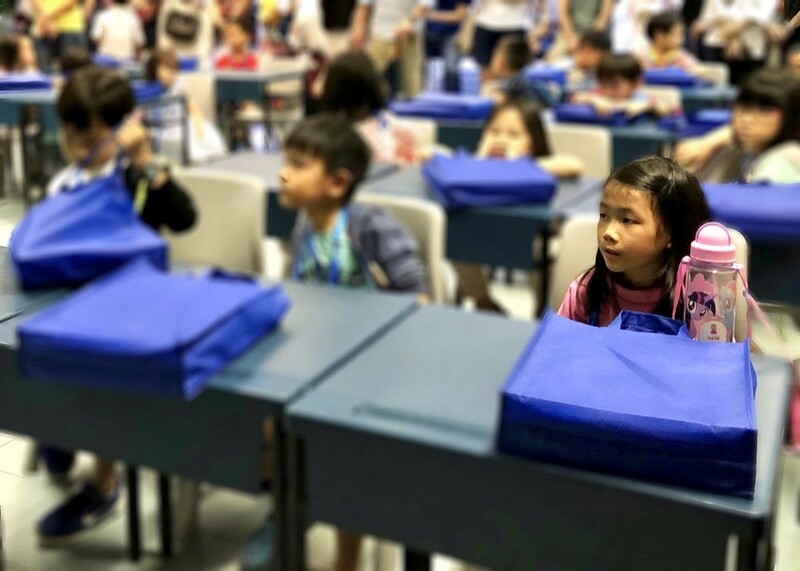 They spent the 2 hours doing simple worksheets, singing songs and listening to their teacher explain some basics about next year such as "If you need to go to the toilet, you have to raise your hands." Last night, she stayed awake in bed for a long time. Finally, she said to me, "Mummy, on the first day of P1 can you come with me?" I sensed that she was anxious. I assumed that because she has been to the school many times to pick her brother up, it wouldn't be too unfamiliar. But she said, "The school is very big, what if I get lost?" Comparing her current school to her new school, that must be really daunting. Today, she asked me many questions about P1 and when I asked if she is afraid, she teared and said yes. I have forgotten how long it took her to settle into her childcare at the beginning of the year! Poor girl, for some children like her, transitions are hard. I've decided to take her out from childcare for a few days and send her to my centre for our P1 prep camp. I thought she was all set for the transition as she is academically ready and classroom ready. But she has a lot of anxieties and fears about the big change. The camp will be good for her as they get to practice new and unfamiliar things to gain confidence. Taking on responsibilities like being the class monitor, learning to read the timetable and how to pack their bags, sharing about their anxieties, discussing what to do if they are bullied, and brainstorming ways to solve problems like getting lost will help equip her and make her less anxious. The kids at camp will be put to the test as they have to make decisions like whether to spend money on food or cute stationery and I'm keen to know what she will do! We were chatting over dinner last night and it feels so strange that #2 is graduating from JC 2, #3 from Sec 4, #5 from P6 and our darling little Kate is embarking on her very first day of formal education come January. One of my teens asked, "Oh mum, you have to go through this all over again! How does it feel?" Honestly, I feel excited! So much promise. So many beautiful years lie ahead for her. I hope she will enjoy her years of learning, make good friends for life, and meet teachers who will touch and inspire her. All the best, little Kate! For K2 kids who need a little boost to get them prepared for Primary 1, check out The Little Executive's practical P1 Prep Camp which runs next week, and another round in December. Wishing you the very best to all K2s in your new and exciting journey ahead!